"Cabbage is nutritious, low in calories, and can be super filling! If you want to lose weight, cabbage should be on your menu! I recently bought the rainbow quinoa from Target® and decided this would be a perfect recipe to utilize this very popular superfood." Bring a large pot of lightly salted water to a boil. Place cabbage on a flat work surface. Cut a circle around the stem and remove the core. Place cabbage in the boiling water. Cover and cook until tender, 8 to 10 minutes. Remove cabbage leaves with tongs as they cook; pat dry with paper towels. Bring water and quinoa to a boil in a saucepan. Reduce heat to medium-low, cover, and simmer until quinoa is tender, 15 to 20 minutes. Heat 1 tablespoon olive oil in a skillet over medium-high heat. Add onion and carrot; saute until softened, about 5 minutes. Let cool. Transfer most of the onion-carrot mixture to a bowl, reserving a small portion of the mixture for the sauce. Add the remaining olive oil, quinoa, beef, pork, 1 tablespoon pasta sauce, eggs, 2 tablespoons dill, garlic powder, onion powder, paprika, salt, and pepper. Mix until filling is well combined. Cut out the thick part of the rib from the bottom of each cooked leaf so it will be easier to roll. Spoon a portion of the filling onto a leaf. Fold the stem up over the filling and fold the sides toward the middle. Roll filling up the rest of the leaf. Repeat until the filling is used. Finely shred the remaining cabbage. Combine remaining pasta sauce with chicken broth, garlic, sauerkraut, and 2 tablespoons dill in a bowl. Spread a few tablespoons of the sauce over the bottom of a baking pan. Add the shredded cabbage. 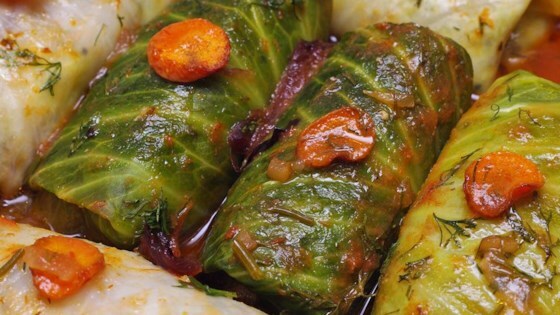 Place cabbage rolls seam-side down in a single layer on top. Pour remaining sauce over the rolls. Cover with aluminum foil. Bake in the preheated oven until cabbage rolls are tender, 60 to 90 minutes. Any ground meat will do. Use regular tomato sauce instead of pasta sauce, if desired.